IObit Malware Fighter is a free utility for malware and spyware detection and removal that’s both reliable and easy to use at the same time. 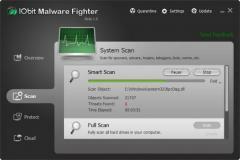 IObit Malware Fighter’s anti-malware engine is able to quickly detect even the most complex and hidden malware and thoroughly clean your computer from infections. - Detection and removal of any malware infections and hidden threats such as spyware, adware, viruses…etc. - Real-time protection is enabled against all types of malicious behavior. - Can work in conjunction with any antivirus applications. - Works on Windows 2000, XP, Vista, 7 and 8.